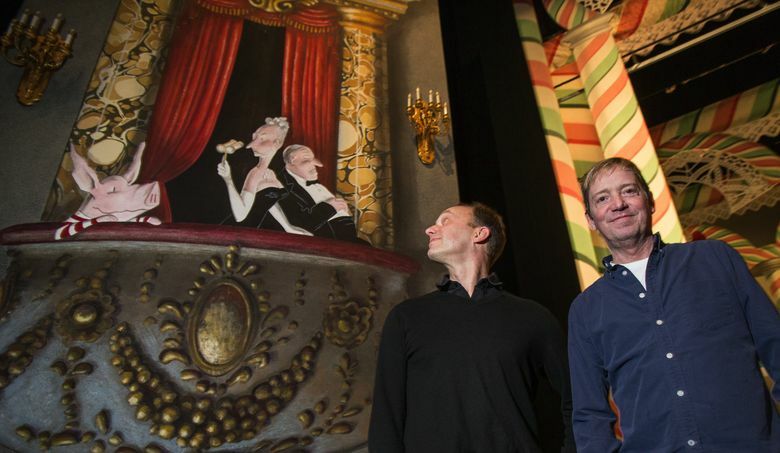 The curtain will rise Nov. 27 on a new production of “The Nutcracker” at Pacific Northwest Ballet, for the first time since 1983. It’s a mixture of new and old: George Balanchine’s 1954 choreography, and world-premiere sets and costumes by Ian Falconer. A rabbit playing a drum? Dancing candy canes? Clara, at the party scene, in a dress of bright red-and-white stripes? Adjust your eyes: It’s a sparkling new production of “The Nutcracker” at Pacific Northwest Ballet — for the first time since 1983. 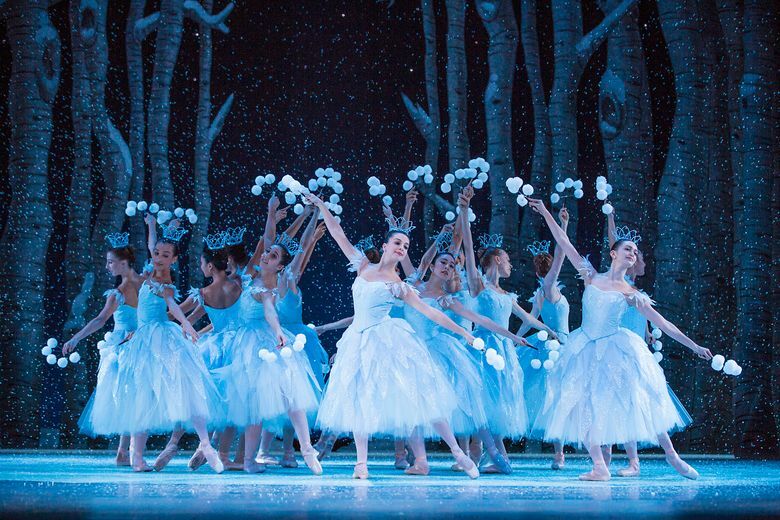 And it’s actually a mixture of new and old: The holiday ballet features George Balanchine’s 1954 New York City Ballet choreography, and world-premiere sets and costumes by Ian Falconer. Falconer’s name may not be familiar, but if you’ve known a child over the last 15 years, you might know his work: He’s an illustrator and author whose best-selling picture books about Olivia — a hyperactive, bossy and thoroughly charming young pig — have delighted a generation. With sets and costumes by Ian Falconer, Pacific Northwest Ballet, Nov. 27-Dec. 28, McCaw Hall, 321 Mercer St., Seattle; $25-$156 (206-441-2424 or pnb.org). 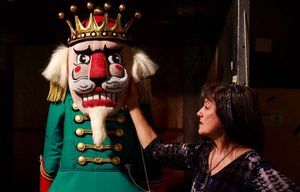 After deciding early last year that it was time to retire PNB’s long-running “Nutcracker,” which debuted in 1983 with designs by Maurice Sendak and choreography by Kent Stowell, Boal turned to another children’s book author. Nearly three years after their first conversation about the idea, the Balanchine/Falconer “Nut” is almost complete. And it’s been a vast undertaking for the designer: 154 costumes, 22 different painted backdrops, and a wealth of detail, including an opening video depicting a snow-covered 1850s Vermont town (made by local firm Straightface Studios), a 40-foot Christmas tree festooned with 450 lights, a Mother Ginger costume big enough to conceal eight children, a magic bed and a walnut boat hoisted by flying reindeer — whose animation is due, in one of numerous creative solutions, to windshield-wiper motors. There were, Boal and Falconer agree, some setbacks along the way: “The silly [PNB] board wouldn’t let us dig a trench” in which to sink the Christmas tree, said Falconer, facetiously. (NYCB has one). But the end result, they say, is a production that’s entirely Seattle’s, after borrowing what works from the long-beloved NYCB production. “Our motto is: Everything they do in New York, we’re going to do better!” Boal said. The tree, they say, is a few feet taller than NYCB’s. The costume for Mother Ginger — who totters onstage in a vast skirt that conceals eight children — is a little bit bigger. The snow (“we’ve upped the dosage,” said Boal) will be a veritable blizzard. While much of the attention is going to the new sets and costumes, this “Nutcracker” will be new to Seattle in another way: For months now, the company and 140 young students from the PNB school (for two casts of 70 children) have been learning Balanchine’s choreography. Though Balanchine’s wasn’t the first American production of “The Nutcracker” (that was San Francisco Ballet, in 1944), it was the first to truly catch on with U.S. audiences as an annual holiday tradition. The story of a little girl who falls asleep Christmas Eve to dream about traveling to a magical kingdom, “The Nutcracker” is actually nearly 200 years old: It’s based on the story “The Nutcracker and the Mouse King” by E.T.A. Hoffmann, published in 1819 in Germany. Later revised by Alexandre Dumas, it became the basis for the first “Nutcracker” ballet, which was premiered — with Pyotr Tchaikovsky’s instantly classic score — in St. Petersburg, Russia, by the Mariinsky Ballet in 1892, choreographed by Lev Ivanov. Among the children who performed in that ballet in subsequent years was a young Balanchine, who appeared as a mouse, the Mouse King, Nutcracker/Young Prince, and a jester with a hoop. Decades later, in New York with his fledgling company New York City Ballet, the choreographer drew upon those memories to create his own full-length “Nutcracker” in 1954. “That’s why you have so many children in the ballet,” said Ellen Sorrin, director of The George Balanchine Trust. The ballet, made under stressful circumstances (“he didn’t have much money at that time, at all, hadn’t built his audience,” Sorrin said), was an immediate hit. Ten years later, it was reworked slightly for its debut at the new New York State Theater, where it still plays to rapt audiences today. That version is precisely what Seattle audiences will see: the same one that Boal performed both as a child and adult dancer in his years with NYCB, the same one that Falconer loved as a boy in the 1960s. Embedded within it are bits of ballet history. The Candy Cane variation is as Balanchine remembered it from Ivanov (and from dancing it himself), and the battle of the Mouse King and Nutcracker was created by that wizard of dance drama, Jerome Robbins, then associate artistic director of NYCB. The story is slightly different from the one PNB audiences have long known. The Stowell/Sendak version had Clara transformed into a grown-up dancer via her dream; in Balanchine/Falconer’s, Clara is danced by a child throughout, with the Sugar Plum Fairy performing the grand pas de deux with her cavalier. The individual dances in Act II have names that stem from the treats Clara’s mother serves at the party: Spanish Chocolate, Arabian Coffee, Chinese Tea, Candy Canes, Marzipan. And Falconer and Boal decided to change the mid-19th-century story’s location from the usual Germany to New England. Managing expectations in the face of a much-loved tradition has been a tricky balance, Boal said. Now, as they address the last challenges before opening night, it comes down to the audience — to those dressed-up kids for whom “Nutcracker” is a yearly rite.